The Ensemble Kluster was found by Conrad Schnitzler in 1969. It can be considered as one of the most radical and influencial german progressive, avantgarde bands. Its music-approach and playing-techniques are related to Stockhausen and the group "Nuova Consonanza" & its influences and protagonistic characteristics in music can still be found in works of many avantgarde & Industrial-bands of today. Conrad’s continous working-partners over the years have been Klaus Freudigmann and Wolfgang Seidel. 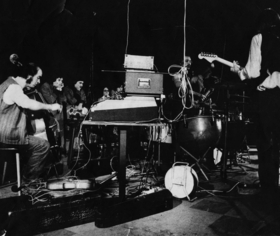 Kluster worked also with various friends including Tangerine Dream or Hans Joachim Roedelius and Dieter Moebius with which Conrad recorded and released three of the Kluster-Actions on Vinyl in 1971 called „Eruption“, „Klopfzeichen“ and „Zwei Osterei“ and which then went on to form the Band Cluster. Kluster performs with regular Instruments (Piano, electric guitar, Cello, percussion, electric organ).. Those sounds are recorded with a contact-microphone, transformed, manipulated, distorted, chopped-up, conveyed by loudspeakers. The result is an exciting, raw and roughly structured Sound-continuum, rich on associations and of a fascination reminding and edging of a sound-magic.